NEW YORK (CNNfn) - AT&T Corp., the largest long-distance telephone and cable television company in the United States, has had a long and storied history � from its founding in 1877 by Alexander Graham Bell and his partners, to its break-up in 1984, to its current restructuring into separate consumer, business, broadband and wireless operations. The latest twist in the AT&T saga came Sunday, when its broadband-cable television unit drew an unsolicited $44.5 billion bid from Comcast Corp. AT&T says it currently does not plan to sell its broadband unit. 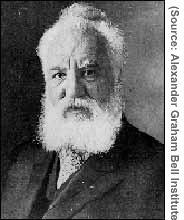 AT&T � Following Alexander Graham Bell's invention of the telephone in 1876, he and his financial backers, Gardiner Hubbard and Thomas Sanders, formed the Bell Telephone Company in 1877. AT&T was incorporated in 1885 as a subsidiary of Bell, to build and operate the first long-distance telephone network. In 1899, AT&T bought Bell's assets and became the parent company of the entire Bell system. 1927 marked AT&T's launch of long-distance telephone service to London using two-way radio, at a cost of $75 for five minutes. But radio-telephone service was spotty, and in 1956, submarine telephone cable service to Europe was offered. Transpacific cable service began in 1964. Initially, AT&T operated as a monopoly, with the grudging acceptance of the United States government. But in 1984, following the settlement of a civil antitrust suit with the Justice Department, "Ma Bell" was split into seven regional "Baby Bells." AT&T kept Bell Labs, telephone equipment manufacturer Western Electric and a long distance service. The Baby Bells got the Yellow Pages and local service. In September 1995, AT&T announced a restructuring that would amount to the largest voluntary break-up in the history of American business. AT&T remained a communications services company, Lucent Technologies took over systems and equipment, and NCR became a computer company. In October 2000, AT&T said it would restructure into a family of four separately traded companies, for its consumer, business, broadband and wireless operations. LUCENT � The telecommunications equipment maker Lucent Technologies Inc. (LU: up $0.23 to $6.33, Research, Estimates) �was spun off by AT&T in 1996. In late May 2001, it called off its acquisition by French telecom gear maker Alcatel. Lucent has spun off units of its own, Avaya Inc. and Agere Systems Inc., in a bid to restructure its struggling, money-losing operations. AVAYA � Lucent spun off its corporate telecommunications company last October into Avaya Inc. (AV: up $0.09 to $13.13, Research, Estimates) , which offers communications networks to companies and governments. AGERE � Lucent partly spun off its optical components and semiconductor unit, Agere Systems Inc. (AGR.A: up $0.07 to $6.99, Research, Estimates) , in late March. It plans to spin off the rest of its stake in Agere by Sept. 30. NCR � AT&T acquired computer maker NCR in 1991; in 1997, it spun NCR (NCR: down $6.13 to $38.64, Research, Estimates) �back out as an independent entity. AT&T WIRELESS � AT&T launched the tracking stock of its wireless unit in April, 2000. On July 9, AT&T Wireless (AWE: down $0.64 to $16.51, Research, Estimates) , the nation's third-largest wireless telephone operator, became the first of the four units to be spun off into an independent company under the reorganization. AT&T BROADBAND � The broadband unit, which includes cable, is expected to have an initial public offering (IPO) for a tracking stock later this year and will be formally separated in 2002. Cable-television company Comcast Corp. made an unsolicited $44.5 billion stock bid on Sunday to acquire the broadband cable-television unit, but AT&T said it had no plans to sell. AT&T CONSUMER � Under the latest restructuring, a new consumer tracking stock will mirror the performance of its residential long distance and WorldNet Internet access business. AT&T BUSINESS � The business services company, AT&T business, will retain AT&T's existing stock symbol "T."
AMERITECH � The Chicago-based Bell operating company that was acquired in 1998 by the parent of Southwestern Bell. BELL ATLANTIC � The regional Bell operating company for the Middle Atlantic states, which agreed to acquire NYNEX in 1996 and last year merged with GTE and was renamed Verizon Communications (VZ: up $0.98 to $54.25, Research, Estimates) . BELLSOUTH � The regional Bell operating company for the Southeastern United States, BellSouth (BLS: up $0.41 to $40.31, Research, Estimates) �remains independent. NYNEX � The New York-based regional telephone company for New York and New England was acquired in 1996 by Bell Atlantic Corp., now Verizon. PACIFIC TELESIS � The parent of Pacific Bell, which spun off its AirTouch wireless unit in 1994. AirTouch was later acquired by Britain's Vodafone in 1999. Pacific Telesis, meanwhile, was acquired in 1996 by SBC Communications Inc., the parent of Southwestern Bell. SOUTHWESTERN BELL � Started as the local telephone company for the Southwestern United States. Its parent company, SBC Communications Inc. (SBC: up $0.32 to $40.32, Research, Estimates) , in 1996 bought San Francisco-based regional phone company Pacific Telesis and in 1998 bought Chicago-based Ameritech. US WEST � The Denver-based regional telephone company serves the Rocky Mountain states. High-speed fiber-optic networks company Qwest Communications International made an unsolicited hostile bid for US West in 1999 and completed the deal last year.